Intel teams up with Survivor creator to announce a million-dollar reality show, too. In years past, Intel would have used its Intel Developer Forum to unveil its processor roadmap, run some benchmarks, and call it a day. But at IDF 2015, the company’s just-launched “Skylake” processor got as much stage time as the so-called vending machine of the future. Instead, Intel emphasized the Internet of Things: not the company’s traditional focus, but what it is building its future around. 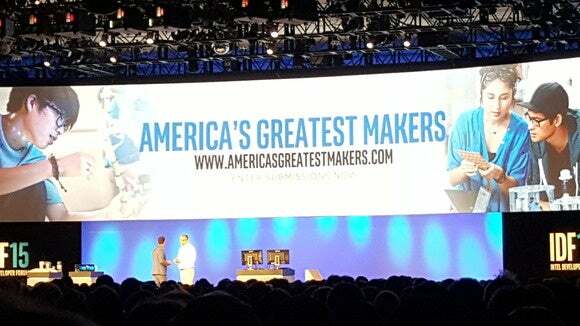 And perhaps the biggest announcement was a reality show, America’s Greatest Makers, with Mark Burnett, the brains behind Survivor. The million-dollar contest will track ideas in the IoT industry from their concept to development, with Intel responsible for judging the winner. “I continue to see IDF as one of the places in the world to see the future in technology and innovation,” Intel CEO Brian Krzanich said. Signups are taking place now, Intel executives said. Before the keynote even began, attendees were treated to a digital pinball game, as giant inflatable balls bounced around the audience. A Rube Goldberg-like contraption launched the keynote itself, together with flying “IDF” balls floating above. All of those were bult with Intel technology, Krzanich said. Krzanich said that the traditional IDF format of showing the company’s roadmap had worked for many years, but that the company wanted to push further than ever before. Intel now assumes three things about the future of computing, Krzanich said. The first assumption is what Krazanich called the sensification of computing: that computers will see, hear, and touch. The second assumption is that everything will become smart and connected, opening up a universe of possibilities. The third assumption is that computing becomes an “extension of you,” coming alive through wearables and other technology. Computing used to be confined to a two-dimensional world, with a keyboard, mouse, and a touchscreen. “But thats not enough for today’s world,” Krzanich said. The new dimension is sound. To date, sound has come from the PC. 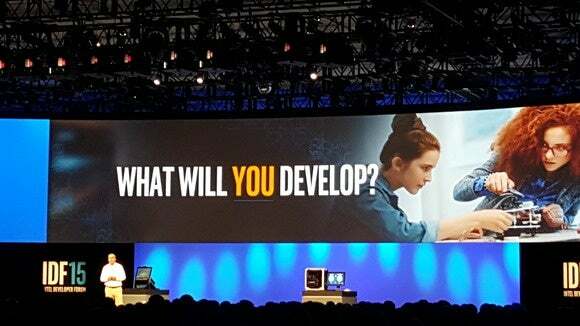 In the future, Intel envisions that your computer will always be listening. “Communicating with a device should be a two-way conversation, like we have in our lives,” he said. Intel’s SmartSound technology is one of the most important breakthroughs in digital audio in some time, Krzanich said. A “wake on voice” feature will wake a Windows 10 PC just by saying, “Hey Cortana.” Intel executives gave a brief demo of Cortana’s capabilities, including playing music. “This starts to allow you to have a real conversation with your device,” Krzanich said. Wake on voice will be available in Intel processors from Atom to Core. Krzanich also showed off technology in an Android tablet, where Intel and Google had redesigned the audio path in Android Lollipop to eliminate the ambient latency. It’s only available on Android devices powered by Intel—a minority in the Android space. Intel also invented the RealSense camera, a depth camera that uses a combination of infrared and conventional light to illuminate and recognize a face. Intel used RealSense as the basis for Windows Hello, the facial recognition technology built into Windows 10. But RealSense can be used for so much more, Intel executives said. Krzanich showed a smartphone powered by Google’s Project Tango, which integrates computer vision into an Android smartphone. The Tango phone used a RealSense feature called “meshing” to scan real-time objects and transform them into virtual objects. “I truly believe that the potential of this is truly endless,” Krzanich said. Next up: a virtual butler named Relay.by a company called Savioke. Hotels can use the robot to deliver sundries like toothbrushes. The robot autonomously navigates through the hotel corridors, to the room, interacts with the customers, and returns back to its charging station. The robot even delivered a Diet Coke to Krzanich on stage. “We believe that the robotics industry is on the brink of a breakthrough here. Robots have already had eyes,” but never the capabilities to build a map of the world around it. Intel said that ROS, the OS for robots, will now support RealSense—as well as MacOS, StructureSDK, Windows, Android, Unify, and more. As PC gaming evolves, Intel needs to focus on two things, Krzanich said. One, to tightly couple the game with sensors, to align the game with the real and virtual world; and two, to deliver enough horsepower to drive it. Intel showed off a Skylake system driving iRacing. Skylake, the successor to the desktop Broadwell chips Intel recently introduced, would normally be the focus of the keynote. But with Intel’s thrust into the embedded space, Skylake was almost an afterthought. In fact, Krzanich seemed to care more about game broadcasting than actual game playing. 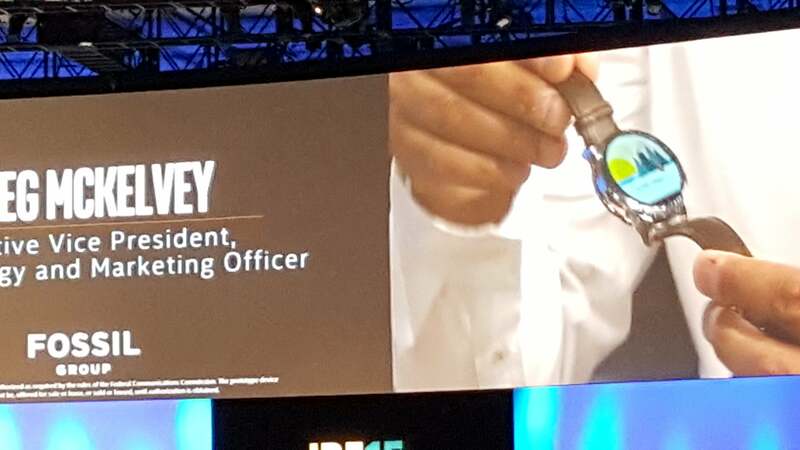 Intel showed off a RealSense camera manufactured by Razer, which will ship in the first quarter. Today, gamers use cameras with green screens to broadcast over the Internet. With RealSense, anyone can do it, Krzanich said. Krzanich then showed off a number of smart devices with Intel technology built in. Krzanich and an employee demonstrated a smart mirror from Memomi that actually changes the color of your reflection’s clothes, without having to change the clothes themselves. The same employee then brought in her daughter to show off the Fuhu Nabi clip, an electronic tether that will alert you if your child wanders off. It will be on store shelves this holiday season, Krzanich said. The “vending machine of the future” can recognize you (or at least your gender and age), with a translucent video screen designed to sell you a snack. “As you move across verticals, you can see these products offer opportunities for smart retailers,” Krzanich said. To secure them, Intel developed a technology called Enhanced Privacy Identification, to secure data as it is passed between IoT devices. Intel has licensed it to Microchip and Atmel, Krzanich said. As everything becomes smart and connected, computing becomes an extension of you, Krzanich said. Fashion watch maker Fossil had the same vision, and Krzanich introduced Greg McKelvey, chief strategy and marketing officer for Fossil, to show off its holiday product line of connected accessories, which will launch at the end of October: a connected watch, a connected Android watch, and a smart bracelet. “We believe the sky is the limit for wearables,” he said. At CES, Krzanich talked about the Curie module, a processor that can fit inside a button. It includes a Quark device, a Bluetooth radio, and battery charger. And now Intel has made one, Krzanich said. “When you have that kind of power, and that size of form factor, the possibilities are endless,” he said. Curie can be used as a sensor hub as well as a platform. Using a Curie-powered BMX bike, Curie analyzed the tricks a rider did and actually identified them, Tony Hawk style. The biker then jumped over Krzanich. “Imagine all the sports that can be digitized,” Krzanich said. One of the ways that Intel wil enhance Curie is by four “software kits.” Two, the Intel Body IQ and the Intel Social IQ, have already been announced. Intel announced Time IQ, to intelligently manage tasks, calendar, and planning, as well as Identity IQ, which will identify the user. For select hardware partners, Intel plans to have these kits in hardware partner plans in the fourth quarter. Most hardware makers will have to wait a bit longer. Krzanich showed off the Identity IQ kit in a proof of concept, with “enterprise grade security, and consumer grade usability”: a security bracelet that authenticates a user to her computer when she approaches it. When she removed the bracelet from her wrist, the computer locked. It also prevented Krzanich from logging in, using his biometric data to invalidate him. FInally, Intel showed off its radical new 3D XPoint technology, now called “Optane.” The revolutionary memory architecture will be available in both DRAM modules as well as SSDs next year, Krzanich said. 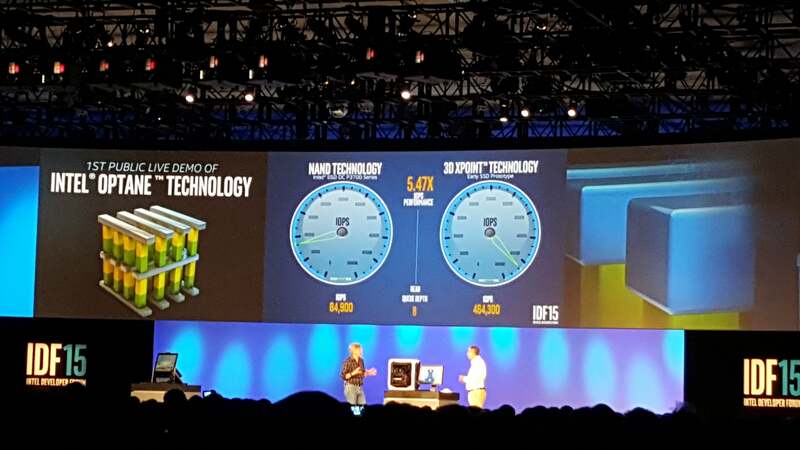 Intel showed off a working prototype that completely blew away conventional memory technology.